» Other News » Tortoise mystery solved ! FOR local crime writer Tom Templeman the case had all the twists and turns of one of his own novels. First there was the discovery one morning in his garden of a hungry and desperate fugitive. And there were false trails and dead ends before the escapee’s family and friends could be tracked down by 95-year-old Tom and his team of detectives. Only by ingenuity, dogged refusal to abandon the search, and the use of cutting edge Internet technology was the mystery finally solved. It was the curious case of the three tortoises. “Brenda, our daughter-in-law, was visiting when she spotted an unfamiliar visitor in our garden – a tortoise, Tom told the News & Mail. However, this was no common tortoise. It was in fact an Afghan tortoise (Testudo Horsfieldii), more commonly known in this country as a Horsefield tortoise. And it was a long way from home. 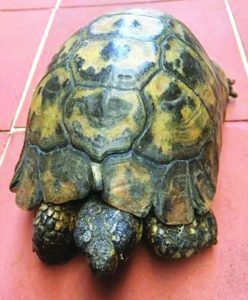 Tom’s neighbour, Caroline Cooper, also posted about the find on Facebook and after a flurry of exchanges, there were, remarkably, three claimants for a missing tortoise. “One was from Knaphill and had been lost for over a week. This was quickly eliminated. A second claimant was also unsuccessful”. More Facebook enquiries led to the owner’s unmasking – eight-year old Lilley Evans from Gosport, more than 40 miles away. But how could a tortoise, even the fastest tortoise in the South, have travelled more 40 miles in less than a couple of days? The explanation was that Emily and her mum Lilley brought the tortoise – named Steve McQueen because he was so fast and liked escaping – with them when they drove up to visit Lilley’s grandmother, Tracy, a couple of days earlier. Tracey just happened to live near Tom. “Steve McQueen had escaped from my mum’s garden in Woking shortly before we had to return home to Gosport,” Emily told the News & Mail. “Lilley was heartbroken that we had to leave without him”. The grateful Evans family presented Caroline with a bottle of wine and a bunch of flowers, while writer Tom was honoured with a poem written especially for the occasion. 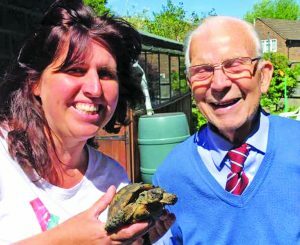 Of the two unsuccessful lost tortoises, one, by the name of Bert, was happily re-united with its owner Lisa Appleby, three weeks after going missing. The fate of the third is, sadly, unknown.